How much can I earn from Adsense through my blog? 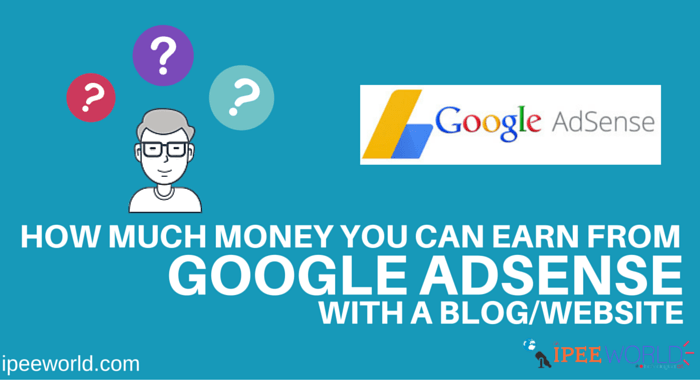 This is one of the most asked questions by newbie bloggers about AdSense. If you go through Quora, you can see a lot of questions regarding this topic.And today in this article I will post about How much you can earn from Adsense through your Blog or website.Recently I have also posted a post which will help you to How To Verify Google Adsense Account Without PIN | Address Verification. The earnings you get depends upon a number of things. It’s not just a matter of a single thing. When going through the AdSense Dashboard, you may see some terms like CTR, Page RPM, CPC, Estimates Earnings, etc. Don’t get mad, I will help you to figure what exactly are those things and How it will help you to calculate the earnings you get. Let say, Blog A is having 1000 Pageviews and the Blog B Has 2000 Pageviews. Now, which blog will get the highest earnings, You may tell it is Blog A someone will say it is Blog B. But, we can’t determine which one will get highest earnings. The quality of the traffic and Country from your visitor comes play a major role in your revenue. Out of 1000 visitors, Blog A got 500 visitors is from tier 1 countries like USA, UK, Australia, then the earnings will be high. So, this means, Geographic location of the Globe to your blog matters! Google Adsense Is the primary earning source for almost all bloggers and internet marketers.The best fact about Google Adsense Is that there Is no minimum traffic you need in order to get accepted to Adsense.If you have a blog which completely accepts their TOS then you will definitely get an Adsense Approval. 0.1 How does AdSense Revenue Work? 0.2 How Much Can You Earn? How does AdSense Revenue Work? Adsense has both CPM and CPC based revenue model.Now let’s check the basic factors about Adsense. CTR = (Number of ad clicks x 100) / number of page views. If your blog has 10.000 pageviews per month and 900 Adsense Ad Clicks then your CTR is 0.9 percent. Most of the ads in Adsense are Cost Per Click based this means that You will only get paid when someone visits your blog and clicks on an Adsense Ad.There are also CPM based ads which will generate earnings if someone views it no need to click. CPC and CTR are the primary factors that determine your revenue.CPC depend on various factors like your blog’ niche and Geographical location of the visitors. If your majority of visitors are from tier 1 country like US, UK, Canada, Australia, etc, then you will have many good earnings and if your visitor comes from Tier 2 and 3 countries like India, the CPC will be much lower as compared to Tier 1 countries. You also need good CTR for more ad click.This depends on a lot of factor like Ad Placement, Traffic sources. web page loading time and much more. These are the two primary factor and when we combine both we call it as RPM. Estimated Earnings = CPC * Total Number of Click. This means that if your RPM is $5 then you will be making about $5 for every 1000 page views. Then if you are receiving about 10000 page views, then you will easily earn about $50. So, guys, this is how much you can earn from your blog with AdSense. AdSense is a great Ad Network for any type of blog to show advertisement. If you are having visitors from Tier 1 countries, then your earnings will be more as we are having More Page RPM and CPC. Having good Page RPM will definitely increase your AdSense earnings as well. I have started a new blog. And i seem to get very low visitors for my blog. Like around 40-50 per month or so. How much may i earn ? I have started it just now and i am adding contents daily. I'll add more contents soon. How much will i get for this current blog for least page views ? Thanks for giveng usefull information. Adsense and affiliate marketing, both are the major sources of online income. Well, earning through adsense is purely depend on the genuine organic traffic. More organic traffic means income will increase automatically.. For example, if your blog getting traffic only from social networking or direct it won't help to raise your income. This is my blogging experience, i always prefer at least 89% of organic traffic must come to my blog. Thanks Astro Joseph! sharing your knowledge. The best thing about AdSense is that you never know how much that next click will be. Get a few $5 clicks in one day and that usually gives people a record earnings week. Some niches are high paying niches so quality content, good search engine rankings and good placement can be profitable. I’ve noticed that people coming to my blog from the search engine and click an ad is more then someone just typing my URL into the address bar, browsing the blog and clicking on an ad.